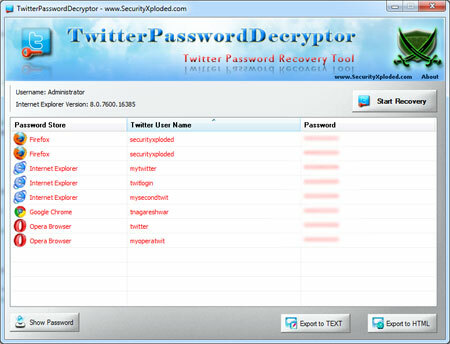 TwitterPasswordDecryptor is the FREE Software to instantly recover Twitter account passwords stored by popular web browsers. Twitter Password Decryptor is the FREE Software to instantly recover Twitter account passwords stored by popular web browsers. TwitterPasswordDecryptor currently supports recovering of Twitter password from following web browsers. * Internet Explorer * Firefox * Google Chrome * Chrome SXS/Canary * CoolNovo Browser * Opera Browser * Comodo Dragon Browser * Apple Safari * Flock Browser * SeaMonkey Browser Here are the maiin features ------------------------------------------ # Instantly decrypt and recover stored encrypted Twitter account password from Popular Web browsers. # Automatically discovers the supported applications from their respective install location and recovers the password instantly. # Save the recovered Twitter password list to HTML/TEXT/XML/CSV file # Easier and faster to use with its enhanced user friendly interface. # Included Installer for assisting you in local Installation & Uninstallation. 'Twitter Password Decryptor' works on wide range of platforms starting from Windows XP to latest operating system Windows 8. Windows Password Recover Kit is a handy tool for all-level users to recover, unlock and reset forgotten Windows password. Easily reset local administrator and domain administrator password for Windows 7/2008/Vista/XP/2003/2000 system. Asterisks Password Buster is a simple and universal asterisks password viewer tool, helps you reveal the hidden passwords on password dialog boxes and web pages, that are covered by the asterisks (*****). VBA Password Remover Download - VBA Password Remover Tool is a professional &amp; easy to use app to remove VBA Password from lost and protected VBA files. VBA Password Remover can help you to restore VBA Password easily and quickly. VBA File Password Recovery designed to restore lost and forgotten passwords from password protected vba project files such as (.doc, .xls, .xla) etc. V2 Softlogic Pdf password restrictions unlocker program decrypts pdf pages, and enable pdf permissions to print file, edit content, copy text & graphics on clipboard, delete pdf open & owner password security to allow commenting & signing etc. LastPass is a free password manager and form filler that makes your web browsing easier and more secure. The last password you'll have to remember. Supports IE,Chrome, Safari and Firefox, allows importing from other vendors and the builtin manager. Advanced VBA Password Recovery software is an easy to use program for Visual Basic Password Recovery (VBA). It provides easy solution to remove any VBA password in few minutes. Paloma, the password repository, provides rock solid passwords protection with no underground unknown processes and absolutely no interference with other programs. Easy to use with its "bookmarks like" tree passwords organization. Windows Password Recovery tool is an ultimate password recovery and auditing solution based on unique multi-pass analysis algorithms and offering unsurpassed efficiency to inexperienced users and password-recovery experts alike. PDF File unlocker software helps you to unlock secured PDF documents. By using this advanced utility you can unlock secured, protected PDF files. AD Password Reset is a powerful Windows password recovery tool to reset local administrator and domain administrator passwords on Windows 7, Vista, XP, 2008, 2003, 2000. Regain access to your locked computer when you forgot Windows password. This site does not contain serial number, crack, keygen Twitter Password Decryptor serial number : serial number is the simplest type of crack. A serial number(cdkey,product key,etc) is register the program as you may already know. a crack or keygen may contain harmful software. If you cannot find the exact version you want, just give it a try. for more information read .nfo/.txt/.diz file include in zipped file.